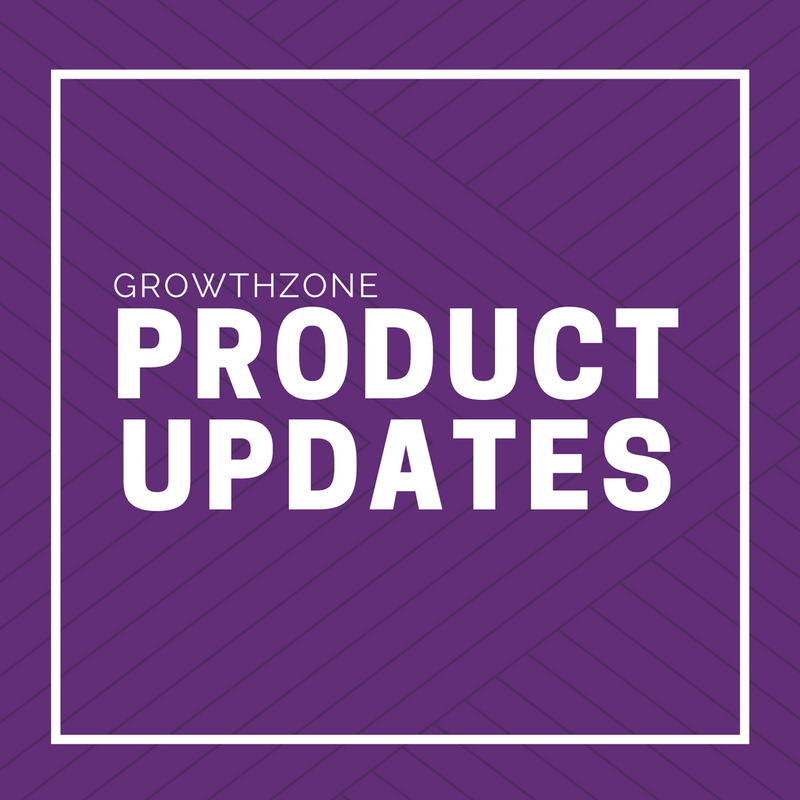 Learn about the new features added to your GrowthZone software this month. EVENT PURCHASES OF ADDITIONAL ITEMS ONLY: We now better track those registrants that only purchase an overall registration additional item. They’re now listed on the attendee tab, recorded in the Event Activity Report, listed on the Attendee Download, and the invoice that goes out will now list out the event it came from. DISCOUNTS: You can now select multiple membership types at the same time when creating a membership type discount, saving you from having to create multiple discounts if applying it to multiple memberships. Where you will see this improvement: In an event> Attendee Setup Tab> Add a Membership Type Discount> and you will now see a multi-select dropdown for Membership Type. See a screenshot of where this is. ADDING A SPONSOR: When adding a sponsor to an event, you can now easily add an existing org/individual and it will automatically pull in the URL and Logo that you have for them in their contact record. Watch a video on how this works. IMAGE SIZES: We have increased the size of the sponsor images that display on bottom of the event registration page, so that they are more legible. We've also made it so images do not skew, meaning you no longer have to only use square sponsor images. There were also a few updates we made to the sponsor images that are included in event emails. EVENT DETAILS PAGE: You will now see that the event details page in the Info Hub has a more modern clean look. With larger images, a map, and a better layout, see a screenshot of what this looks like now. REGISTERED FOR: When logged into the Info Hub, and members come across an event that they have already registered for, they will now see a little "registered" indication, letting them know at a glance which they've registered for and which they haven't. See a screen shot of what that looks like in different places through out the software. When creating a Hub account, it will now validate on email AND last name (previously it was only validating off of email). A new checkbox (located on the Login Settings screen), called “Require Membership Number or Invoice Number for Account Activation”, is now available. If enabled, members will need to enter a valid membership/invoice # in order to create their Hub account. This can be used to either streamline the form process where a member simply enters this number and the rest of the form is filled automatically or you can use it as an extra level of validation to ensure only members are allowed to create an account for the hub. See a screenshot. You can also check out our support wiki on this topic. On the Login Settings screen, you will see a new checkbox called “Enable Access Levels by Membership Type for Info Hub Accounts.” If enabled, a list of your memberships types will be presented along with the ability to select which access level those particular members should be defaulted to upon Hub account creation. This allows you to set very granular access to hub-related member benefits and ensure only your members are seeing important member-only items like directories, job boards, or deals. See a screenshot. You can also check out our support wiki for more information on this topic. On the Accounting Transactions Report, you are now able to add individual and/or organization custom fields to the fields to display and the criteria/filter option. DISABLE/ENABLE: We've made some improvements to how we disable/enable Staff Users in the back office. Now, when viewing your staff members, you can click the "x" icon to disable them, meaning their login credentials will no longer work. It will ask you to confirm that action. In that same are, you are also easily able to re-enable that staff user as well, by clicking the curved arrow icon that appears on disabled staff users. See a quick video of what this looks like. DELETING STAFF USERS: Now, when you delete a staff user (setup> staff users> click on name> then, click delete), that username is back up for grabs (previously, the system held on to that name, even though it was no longer being used). This will help a use case that happens frequently: Staff member leaves the organization, but is still a member of the association, they can then utilize that same username again. That member would just need to go through the normal setup process of creating a member user account. For more information on this, check out are support wiki. BILLING: A "Balance" column has been added to the "Pending Delivery" tab in the Billing module, to help staff more easily see their balance at a glance without having to click into each invoice, shown here. CONTACTS: The list of contacts displayed on an organization's profile tab now shows the 20 most recently modified contact, and to see the full list, staff can click the list icon or individuals tab, shown here. COMMUNICATION: A new notification has been added that will notify staff when a payment is applied to an invoice. The "Invoice Payment Received" notification is available under My Notifications and the staff user will receive the email when a user pays in the Info Hub or clicks the link to the public payment page from an invoice. Now when you change the Billing Contact information on a Scheduled Billing that is tied to a membership, it will also update the Billing Contact information on any additional Scheduled Billings and the Billing Contact on associated membership as well. The reverse is also true -- updating it on a membership will also update on associated Scheduled Billings. The Primary Contact on all existing Organization memberships have been updated to point to the primary contact of the Organization when available. If not, it will remain as the Organization itself. This is also the new default when creating a new Organization membership. When a contact is deleted from the database, if they were listed as a contact on a membership or scheduled billing, it will now appropriately remove them as the contact from those locations and fall back to appropriate defaults for each of these areas. Check out our support wiki for more information on this topic.